I wrote this for the October edition of British Airways in-flight magazine, Business Life. If you’ve read Culture Shock, this is like a refresher, reinforcing some of the key points and specific examples. Business as usual is utterly screwed. It values the wrong things, rewards the wrong people and behaves in the wrong ways. Here we are in the 21st century and the world has changed so completely, so profoundly, yet if you took a CEO from the 1950s and parachuted him – and it would be a him, not a her – into 99% of our business organisations today, he’d know his way around. It would generally look, behave and operate in ways that he’d be familiar with. But look out the window – that world you peer down on is transformed from the post-war 50s when the high principles of ‘modern’ business practices emerged. Right now business must make sense of new technologies, generational differences, geopolitical shifts in power from West to East, continued economic crisis and the needs of a planet that is increasingly ravaged. But most all, business must adapt to a world where people are beginning to demand much more from it – where the pursuit of profit alone is no longer enough. We need a revolution. Meanwhile, in dry and dusty California, Patagonia has created a sustainability initiative to actively encourage owners of their outdoor apparel to sell their used Patagonia products on ebay, potentially limiting new product sales. In wet and windy Scotland, upstart craft beer makers BrewDog have twice raised millions from their customers to fund expansion, turning fans into investors, whilst in the close humidity of Bangladesh Grameen has created a pioneering bank and a mobile phone company both of which allow people living in poverty to improve their lives and are financially sustainable. This is what 21st century business looks like: different and better. Changes like these are happening in pockets and often at the edges at first. For the complacent, these evolutions are easy to ignore or deride – ‘pah, might work in California or Bangladesh, but not in my business – what matters here is the bottom line’ or maybe just sheer lack of time is the smokescreen – ‘heh, we’ve got enough on our hands without worrying about this airy-fairy hippy business stuff’. But my argument is this: that the time is now, and a tidal wave is growing in size out at sea, a wave that will wash through the whole of business and more. And soon it will come crashing down on the aging structures and stale, dated attitudes of 20th century business. This is no time to be complacent, great change is coming. Time to build a better boat! So if we were to step back from the businesses of today, and ask ourselves ‘what can we learn from these early pioneers to help us design a 21st century organisation?’, what would we come up with? Here’s a flavour of what I found when I researched my book Culture Shock drawn from three chapters: Purpose & Meaning, Leadership and Fair Finances. 21st century businesses have a higher purpose and creating meaning that goes beyond the work itself and the creation of profits. They stretch to solve a great problem that matters to society. I call this a ‘Purpose of Significance’. Here’s an example – have you heard of Noma? If you’re a foodie, the answer is of course yes. Noma was ranked as Best Restaurant in the World by Restaurant in 2010 and 2011. Noma isn’t in New York City, Tuscany, the hills of Catalunya, Paris, London or Tokyo. Noma – famous for dishes and flavours that celebrate the very best of Nordic produce – is in Copenhagen, the gorgeous capital of Denmark. When you start to look into the story behind Noma there’s a fabulous and inspiring story of how purpose and meaning can fuel incredible achievement, and simultaneously empower a whole generation of likeminded changers. The whole manifesto is simple and inspiring, but for me the tenth aim is the most powerful of all: “To join forces with consumer representatives, other cooking craftsmen, agriculture, the fishing, food, retail and wholesale industries, researchers, teachers, politicians and authorities on this project for the benefit and advantage of everyone in the Nordic countries.” Basically, to go beyond our own self-interests. In doing so Noma created and placed itself in a context of higher meaning that could engage and impassion every would-be employee, every diner, every producer and supplier. It triggered a great change in how Danish society thinks about food. This is what can be done with the power of Purpose of Significance – change that affects millions, for the good. So key to success as a leader in the 21st century are these values of collaboration, dialogue, transparency and authenticity – command and control just won’t work any more. A great example of this that I discovered is at W.L. Gore, makers of Gore-Tex. Gore is quite a different business, and has been way ahead of its time for more than half a century – it’s just taken the rest of us a while to catch up! At Gore they talk about Leadership being ‘defined by followership’. That is, that the group nominates its leaders – they “vote with their feet” as CEO Terri Kelly puts it. Quite simply, you cannot be a leader at Gore without having people that are willing to follow you. Love it! I believe that this mindset will grow in a world where our teams are dispersed, increasingly made up of freelancers associates and the influx of Millenials who are more willing to ask ‘why?’. We increasingly need to manage our teams like volunteers rather than conscripts. So the questions then for any of us that lead are ‘how do I create followership?’ and ‘why do people choose to follow (or not follow) me?’. This search will lead us to developing a much deeper understanding of people’s intrinsic motivations, beyond money alone. If we can do that, people will follow us, and we will successfully lead in this changing world. In the 21st century there are exciting new ways to raise funds to get businesses financed. And it is no longer acceptable for businesses to reward leaders grossly more than the workforce that contributed so much to those rewards. On the funding side, we are also seeing 21st century innovations happening around how businesses raise cash for growth. I mentioned the rebellious Scottish brewers BrewDog and their fan-funding programme earlier. Whilst those guys organised their own scheme, the web platform Kickstarter is opening up the same possibility to many more businesses. Kickstarter is a platform where I – a creative or entrepreneur – can outline a project I’d like to bring to life: a film I’d like to shoot, a book I’d like to write, a technology I’d like to develop. After describing my would-be project, I can invite the world to become ‘backers’ – that is, to co-fund the development of the project in return for a small reward – a signed copy of the book for $25 or a private reading for $250! Some projects are hugely over-subscribed – like the Pebble customizable watch project, which raised a whopping $10,266,845 against an original target of $100,000 goal, whilst others just meet their targets and some don’t at all. The crowd decides, and the crowd funds: this is crowdfunding and it’s here to stay. And what a powerful prize: turning consumers into investors. Mondragon is an enormously successful Spanish employee-owned conglomerate whose 250 odd businesses turn over in excess of €14bn annually, despite the disastrous performance of the Spanish economy in recent years. At Mondragon a democratic vote within each individual operating company agrees what the ratio will be between the general manager and executives, and those on the frontline – those the ratios vary from 3:1 to 9:1 in the 250 different Mondragon businesses, and the average is 5:1. Why is it that Mondragon has been able to buck the travails of the Spanish economy and continue to thrive? Perhaps this inherent fairness binds the workforce together, creating a culture that is more resilient in challenging times. That certainly makes sense to me. I’ll finish with a story. About a month ago I went to my little boy’s infant school for his leaving assembly. We sat in the school hall in small chairs, lines of us parents, like giant overgrown kids. It smelt like school used to smell, it sounded like school used to sound and I found myself remembering what it was to feel like a kid back at school. Our children came out and danced, spoke and sang. And then they sang the Heather Small song with the chorus ‘what have you done today to make you feel proud?’. Boom. That chorus hit me like a hammer. The innocent intensity of the children singing, the simplicity of the words, it cut through. I know it’s cheesy. It’s kids, it’s a pop song, but really – just then – I thought ‘what have I done to make me feel proud?’. What an epic, challenging question. It makes me wonder, when we stand together as a business community and look back, what will we see? What will we have left behind, what will we have improved, solved and positively changed? Will we be proud of what we did? There are many more examples to share, and I am still discovering more every day, but I hope you can see what I see – that business has to evolve. I believe that it is time for a revolution in business. That it is time for us to reach for more than profits alone. And that the time is now. For more, see the reviews and buy Culture Shock. Just an absolutely inspiring piece of writing about one man’s journey out of corporate life into something that feels meaningful and right to him. Totally uplifting, brilliant clarity. I know Mark and he said he’d been doing a lot of thinking. I admire anyone who can reflect and then express themselves to succinctly, in such an organic-shot-in-the-arm style. I can’t stand board meetings, I dislike the formality of most conferences, networking isn’t something that comes easily and most of all I hate forced innovation in places where I can’t be inspired to think differently. If you bear in mind that I was experiencing this at Virgin, one of the most progressive cultures there is, I wonder if there might be a problem in the structures of business that constrain the way we think and the way we do? Even today my two favourite creative mediums are sea water and muddy hillsides. That is where my ideas live and where I need to go to unleash my potential. As someone put on Twitter, quite literally enlightening! Umeå Energi has replaced bus stop advertising boards with therapeutic illumination, hoping to tackle instances of winter depression. Trendy term, but rarely seen, ‘design thinking’ like this can unlock so much more potential if only we stopped to think, non? Like this solar bag that purifies water as you walk home from collecting it. Clever. Interesting piece pointing out how cluttered the messages are from the top in P&G to regular employees. It’s an interesting challenge, that – communicating succinctly and clearly when one’s organisation and one’s environment are so complex. In a world of VUCA (which I learnt from Stowe’s talk at Meaning, see below) how does one even do that? I struggle (hugely) to do this in our 20 person company!!! It’s time for P&G to rethink what its one message should be. For an organization known for its superior marketing and business discipline, it’s time for it to focus on one unique and meaningful message. We call this the “meaning message,” a concise, commonly understood statement that highlights the true meaning of the organization and which serves to inspire and provide direction. It’s a message that also captures the spirit of the organization. This is Stowe Boyd’s keynote from Meaning 2012. It is jam-packed with brainfood about the near-future of business. I recommend it: you’ll walk away with something to mull, something to pass on. Further reading: For a book that wraps these ideas up into 8 chapters, check out my book Culture Shock – a handbook for 21st Century business. It is well reviewed on Amazon, I wrote it and I believe in it. The world is changing. Damn, THE WORLD NEEDS CHANGING. At its heart, the answer is simple. The vested interests who control the financial architecture, and have an extremely powerful voice in the corridors of power, simply don’t want to change because they still benefit hugely from the status quo, despite seeing the ruin they have brought on all of us. So could it be up to civil society to generate change? The Bank of England governor quite rightly wondered why there wasn’t more outrage at the behaviour of the big banks, but the Occupy movement did show there is a river of anger below the surface that may well turn into a flood. Personally, I think it is only to going to change as a result of real action from civil society. In other words, us. No single institution is going to face up. In Culture Shock, I wrote about Tech DNA, and about how all businesses need to break technology from out of its IT and R&D silos to truly enable the whole organisation. This story isn’t quite that, but it’s still provocative because of the scale. In fact, this is just about giving people access to a particular mortgage app. But what else is possible now? What more does the trojan horse of a new technology bring when rolled out like this? If you’re in or near Brighton or London, and into this stuff, come to the launch party thing, I’ll see you there. This is where it starts. Alex is a master of happiness at work. 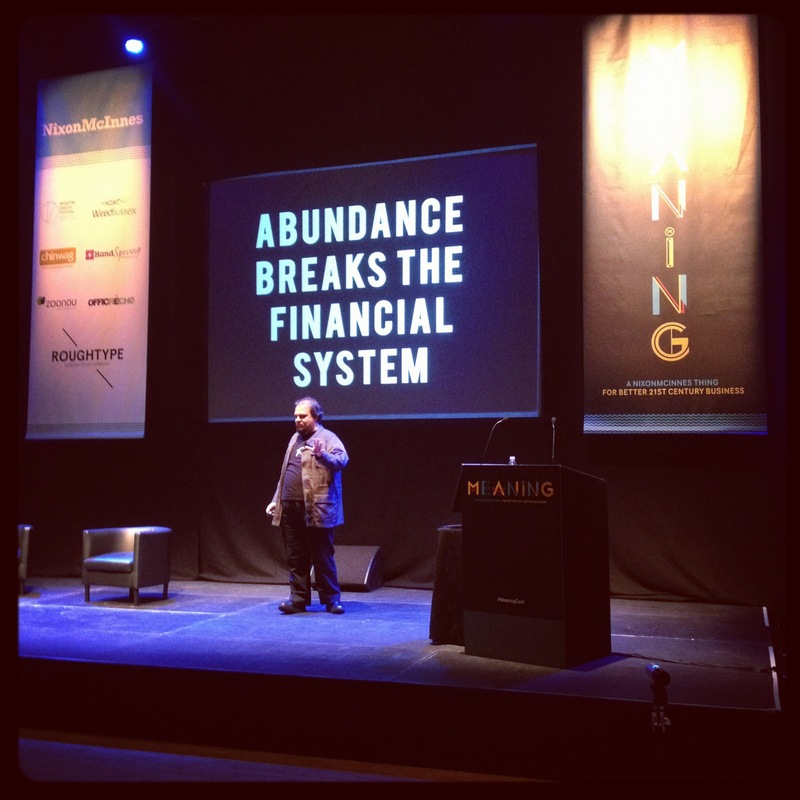 This talk at Meaning 2012 was one of the highlights for many people I’ve spoken with since. This is Alex in top form: 30 minutes of funny, poignant Danish brilliance. Further reading: For a book that wraps these ideas up into 8 chapters, check out Culture Shock. It has a five star rating on Amazon, I wrote it and I believe in it. Just a brilliant, brilliant post by JP that nails our mission at NixonMcInnes. Yes, JP! 100%, yes. A rousing reminder that we are not just putting lipstick on a pig. Really nice piece by Alex on the biases and deeply held beliefs that we have around work which powerfully influence our behaviour without us even realising. Work is unpleasant but that’s normal and there are no happy jobs. The more hours we work, the better. If you’re enjoying yourself, you’re not getting enough done. Lovely old inspiring article about an American cardboard box factory business that runs democratically and in doing so gets an edge in a ruthless horribly commoditised business. “We believed that people should have stock,” says Peter. “They should have ownership. And we thought if we were going to sell people stock, they’d have to have education.” They’d also have to have access to all the financials — open books. Maybe they should even have a voice in the decisions that affect their lives. Absolutely love this quick read from Hugh about culture and curators. Informed by his 15 years at Radio 1, the piece is about how an organisation can best match and engage with the preferences of an audience (by listening) and my take out is pretty simple: you do this best by truly being part of that same culture and hiring and nurturing people that match that culture. Absolutely love the Tumblr-esque images that Hugh starts and finishes with too. And how about a finish with Caroline Lucas MP’s fantastic, funny and challenging talk from Meaning 2012? Brilliant. I know that this talk inspired friends of mine to join the Green Party and others to despair that the excellent Caroline is a lone voice in parliament. Watch this to understand why. Here’s the 22 minute video of a conversation I was invited to by those wonderful people at Wired Sussex as part of their Homebrewed series. In it, we talk about Culture Shock, the roots of NixonMcInnes and the brilliant available future for Brighton’s progressive business community. My first answer is a bit rambley but on the plus side I use the word ‘motherfucking’ at 3 minutes in. Hello – we’ve got three videos and two articles this week. Each of these represents a different facet of the principles and practices in Culture Shock. Each of them is handpicked just for you. If you find 20 minutes for a video this week, MAKE IT THIS ONE! Mesmerising, charming, compelling interview with a very wise South American economist. You may end up in despair. But maybe that’s what you (we) need? Adds more momentum and urgency for me to the ideas of people like Umair Haque, John Robb, Vinay Gupta and those others who see a major collapse coming and a towering need for a new economic system. Found this via Tom Nixon I think. This is Indy Johar’s talk from our Meaning 2012 conference, and I think some of the ideas that Indy floats and the examples he shares bring to life future possibilities for sustainable business. As always with Indy, lots and lots of smart concepts and avenues to follow up. That’s it for me, the headline. KAPOW. Brilliant credible stat for talks and writings for the ‘crowdsourcing is new fangled, unproven and risky’ naysayers. IN YOUR FACE, laggards. 450 big ones. Not sure who to credit with this one so thank you Internet-at-large! Just a brilliant story about quality and passion (again) from Hiut Denim and Do Lectures David Hieatt. I won’t summarise it – there’s no point. Just read it! (And if you like that quick read and want more, watch David’s talk ‘Purpose in Action’ from Meaning 2012). New Models of Leadership? by John Wenger. About as good a piece on the challenge of progressive leadership as I’ve read. Absolutely in line with Culture Shock thinking. Lots to chew on. Probably needs a few reads. Doesn’t that just capture the challenge beautifully? The Cluetrain happened. The business world sees what is happening, finally, but hasn’t made the changes. I really believe that all successful businesses in the 21st century have to have Tech DNA. This is the day job we do at NixonMcInnes helping orgs make the shift to better thrive in a world of digital disruption, so I’m looking forward to using these stats! Thanks to @neilperkin (I think) for the link to this piece. At our conference Meaning 2012 a few weeks back, Stowe Boyd talked about LiquidFeedback as a viable platform to unlock a micro-participation and a new age of democracy. I need to do more research, but as I understand it, this open source software project provides a viable approach for groups – be they political or corporate – to raise issues and vote on them digitally. Could be a huge part of the future, and would love to see if we could use this at NM. Please share in the comments if you know more about this. ‘We’re In a Slow Motion Collapse, TAKE Advantage of the Time Available’ by John Robb. This guy has been about as big an influence on me as anyone in recent times. I found the OODA loop, which led me to think about and then eventually write the chapter on Change Velocity, through John’s writing. This here isn’t a substantial or particularly informative blog post – but if you let it, if you properly pause and open up, it can make you stop and take stock about the time we’re in and what to do about it. The state we’re in and the call for a new economy by Tom Nixon. Building on the above post on the need for systemic change, here’s an interesting and passionate plea by Tom about the role that co-operatives and employee-owned organisations can contribute to a better future. Kickstarter launches in the UK. In Culture Shock there’s stuff, as you’d expect, about how crowdfunding and crowdsourcing are changing the nature of business and the relationships between service providers and ‘consumers’ as they’ve been traditionally thought of. And in particular the fairly straightforward idea that increasingly customers are more like collaborators and investors, citizens are sensors etc. So it’s great to see the most mainstream and successful crowdfunding platform Kickstarter (itself, VC-funded – ah, the lovely irony) now available to list projects in the UK. Whoop! Cor, that was a nice haul eh? 🙂 Bit of something for everyone in there. Do share your links with me on Twitter, and keep spreading these ideas. This is in two parts. Indulgent wallowing in post-Meaning Conference-ness. And then some links as per usual. Quite a momentous week – our inaugural Meaning Conference went off with a massive bang. I don’t really have a great deal to say yet, but here’s a nice photo of Vinay Gupta at a pivotal moment in his brilliant talk, taken by Beth Granter . (All of the speakers did an incredible job, IMO, I just love how this photo captures a moment in time). Even more satisying have been the tweets where people having been spreading ideas to their teams, following up conversations with speakers, making change happen or just reflecting (sometimes frustratedly). That is the mission of Meaning: to really, properly change business. Here’s a bunch of nice photos of Meaning available for you to use under Creative Commons licence. Well done to our Clive Andrews for taking these – he did a brilliant job. If you’d like to get a heads up about Meaning 2013, drop an email to sayhello@meaningconference.co.uk. The Twitter spin room: What happens when politics goes real-time? One of the big ideas in Culture Shock is about this notion of ‘Change Velocity’ – that the information coursing around the world at a new, accelerated ‘real time’ speed demands organisations to move much faster. And that an organisation’s ability to keep adapting at speed will to some extent influence its likelihood of thriving. With that in mind, this is a really interesting look at US politics and the realtime-ness of debates and so on. Great short video of Gore CEO Terri Kelly challenging the age-old model of the all-knowing, all-powerful leader. Nice and succinct. Follows up on the content in Culture Shock about Gore and their model of ‘followership’ vs. leadership. She uses the word ‘courage’. LIKE. ‘True leaders will be judged on how much of that power they distributed through the organisation’. Yes! Help Save Exeter Street Hall, Prestonville, Brighton – here in Brighton a group of people are on a mission to retain a community space and save it from being sold by a church to property developers. It couldn’t be more in keeping with the messages of Meaning and Culture Shock – and it’s real. These guys are serious and need the support of others – please check it out. That’s it for this week, changers-of-the-world. ONWARDS. I wrote this piece for The Argus, Brighton’s local newspaper, a few weeks back. It’s basically the belief that I (and others) have that Brighton, by nature of its vibe, its location, its size and most of all its values, has the opportunity to play a helpful role in showing how to do business better. And to be fair, much of that is deserved. It is right that we are so well known for what we do: our mosaic of gorgeous North Laine boutiques, our cluster of world-class digital hothouses, our endless carnival of cultural & hedonistic experiences, and the rest. But what would it be like if Brighton led the way in not only what its business community does but also how it did it? What if this brave, quirky city could stand up and show the world how to do business better in the 21st century? In how to organise groups, how to motivate people, in what leadership means and how rewards are distributed? What if we can create a new form of business operating system that can spread, but always have its roots in Brighton? I think that’d be pretty cool. So where are the local pioneers already that we can learn from and build on? Here’s a few to get us started. Mooncup is a business that has both an innovative, disruptive product AND does business differently. Mooncup’s product is an alternative to traditional feminine hygiene products. A reusable medical-grade silicon ‘cup’ design (look it up, I can’t explain it elegantly), it is massively more sustainable, and in a way just operating in this area is pretty radical – the product demands quite a mindshift from customers. And yet customers are huge advocates and most women come to Mooncup after hearing positive clamour from a close friend. But as I say, we’re already good at the ‘what’ we do in Brighton, so how do they do business differently? At Mooncup decision-making is entirely flat – at the weekly team meeting anyone can influence up and coming decisions, ‘we all pitch in’ they say. In the team wages are entirely transparent and are calculated purely based on length of service to reward loyalty and create a clear and fair system. Down the road, Infinity Foods shows that different business can still be great Business with a capital b: rammed every day with people picking up ethically sourced dried figs and super-sensitive handcream. Whether we’re shoppers or just observers I’m pretty sure we can see that this co-operative, owned by the people working in the business, the people actually creating the value, is doing pretty damn well. What would it be like if we could extend that, and nudge up the percentage of profits made in the city that stayed in the city? And weirdly, perhaps controversially, I would say the attempt to reorganise our beloved Brighton & Hove City Council had a whiff of the positive, radical and progressive about it. I cannot say as an outsider whether it’s working or how it has been received internally (with resistance, I imagine, given that most of us resist change) but the goal of turning a classically introspective and static bureaucracy into an outward-facing, ‘customer-centric’ organisation should be lauded. If the council can successful evolve themselves into a better shape for the 21st century, they set the bar for the rest of us. There are more: Big Lemon buses, Wired Sussex, Relentless Games, Robin Hood Pub, Cranks bike workshop, The Skiff co-working space, CityCamp, Moshi Moshi. And every year these ranks grow. Each organisation offers us something different to be inspired by – their purpose, their people-centric policies, the collaboration and openness at their core. This is a growing movement of businesses willing to do things differently, here, in our city. In these examples, the change is already happening. But for every positive example there must be ten more local businesses doing things the bad old ways. A warning to those business people that believe it will be enough to be great just at what you do. It won’t. It can’t last. Just pick up a copy of the FT – old skool business is creaking, breaking, collapsing in on itself. The rules have changed. To win the best customers, the best team members, the best reputations, we must change. Change, change and change again. Not just our products, services and marketing, but our very core. And this need for change presents our city and our organisations with a once in a lifetime opportunity: to lead the way, to get there first, and to bring the rest of the world with us. I believe we can do it.